With most of the team shooting poorly, seniors Asia Durr and Sam Fuehring saved the day. Durr finished with 34 points and Fuehring had 21 points and 13 rebounds. BLACKSBURG, Va. (AP) — Asia Durr scored 34 points and No. 2 Louisville overcame a near-collapse in a 72-63 victory over Virginia Tech on Sunday. 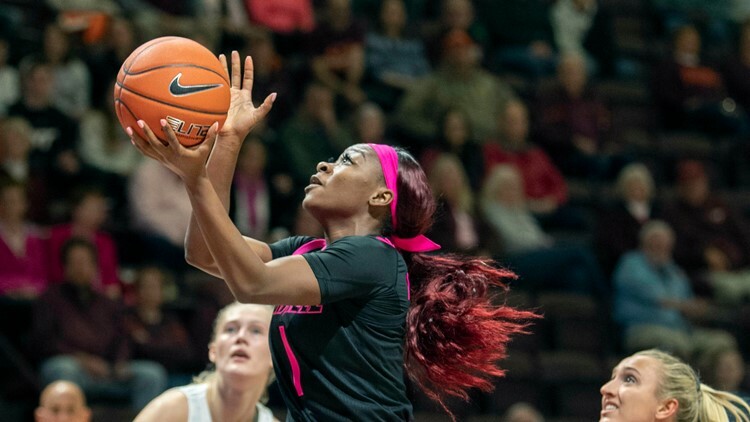 Dara Mabrey scored 17 points to lead the Hokies (15-8, 2-8), but missed a pair of free throws with 3:49 to play that would have pulled Virginia Tech within 62-58. Regan Magarity added 14 points and eight rebounds. Her inside basket with 34 seconds left made it 66-63, but Durr hit a pair of free throws with 25 seconds remaining for the Cardinals, boosting their lead back to five. The senior hit two more with 13.2 seconds left to keep the Cardinals on top of the ACC standings. Louisville: With most of the team shooting poorly, seniors Durr and Fuehring saved the day. Durr finished 11 for 21 from the field and Fuehring was 8 for 12, while the rest of the Cardinals were 8 for 28. The pair was 12 for 12 from the line, and Durr accounted for all five of Louisville's 3-pointers. Virginia Tech: The Hokies have talent, but nowhere near the depth necessary to compete with the nation's elite programs without a lot going right. In the first half, Virginia Tech had eight turnovers that the Cardinals turned into 11 points, while the Cardinals had just one turnover. In the end, cleaning that up could have meant the difference for the Hokies. Louisville: The Cardinals are home next Sunday to face No. 25 Miami. Virginia Tech: The Hokies will be on the road to face Duke on Thursday night.